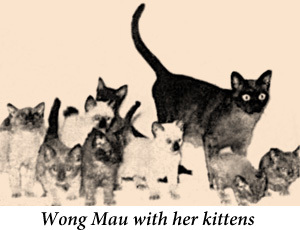 The Burmese breed came to America in 1930 when a Dr. Joseph Thompson brought a brown female cat named Wong Mau from Burma (now Myanmar) to his home in San Francisco. Dr. Thompson believed that she was a new breed of cat and with the help of geneticist Billie Gerst, this was found to be true. Wong Mau was first bred to Siamese males that were also indigenous to Burma and nearby Thailand. Later her offspring were crossbred to produce cats that were pure Burmese. These Burmese cats are believed to be the first breed of animals that were isolated using genetics. Today American Burmese cats come in four colors: Sable, Champagne, Blue and Platinum and all have a pleasing yellow to gold eye color. The first Burmese cats bred were mostly all Sable in color and there was much controversy over the presence of the other three colors. Many who bred Burmese in the early days felt that these cats should only be Sable. They felt the other colors were an impurity that resulted from the use of the Siamese cats in early breedings. Fortunately over time, all four colors have come to be accepted, as these cats are all very much Burmese in their look and character. The Burmese is a solidly built cat with a broad chest and a muscular body. They carry an impressive amount of weight for their size. They have a short silky close lying coat unlike any other breed and are often described as bricks wrapped in silk. The breed standard to which we select our cats calls for a cat that has a rounded head with rounded eyes. This leads to a cat with a unique look which is both sweet in appearance and breathe taking. While the appearance of the Burmese cat is a joy to behold, it is their personality that sets them apart. The Burmese cat is truely a people oriented breed. They are affectionate and loyal to their people, they love lap time and will sleep with you if they are allowed. They are often referred to as the dogs of the cat world for their affection of humans. Their favorite room in the house is the one with you in it!